The new government cannot guarantee embassy security. On Friday, Oct. 4, a Russian Ministry of Emergency Situations plane flew from Tunisia to Moscow, carrying Russian embassy staff and their families that had been evacuated from Libya. The emergency evacuation of diplomats was held after an attack on the Russian Embassy in Tripoli. Local authorities themselves advised Russians to leave the embassy, because they could not guarantee the staff’s safety. On Wednesday, Oct. 2, in front of the Russian Embassy in the Libyan capital, a group of young people organized a protest, after reports that a Libyan air force colonel had been murdered and that the suspect was a Russian citizen. "The relatives of the deceased, his friends and fellow countrymen appeared at the embassy armed to the teeth. There was a serious attempt to storm the building," says Ivan Molotkov, Russian ambassador to Libya. According to him, the attackers forced their way into the residential part of the embassy and caused damage. "Fortunately, the staff had time to barricade themselves in the office section of the embassy,"the ambassador says. According to Molotkov, there was "indiscriminate firing" during the assault. "The windows, doors, and walls are all covered in bullet holes," he says. Later, by Molotkov’s account, the Libyan authorities "sent reinforcements" to protect the embassy staffat the request of Russian diplomats. During the incident, two attackers were killed and two others were seriously injured. A few locals, the military council of the district where the embassy is located, and a rapid response team came to the embassy to help restore order and prevent further attacks on the building. "As soon as the situation is more or less cleared up, [the diplomats] will return to Libya, headed by a temporary chargé d'affaires," says Molotkov. The Russian embassy is currently vacant. "There is no one in the embassy," Molotkov says. According to him, the diplomats are of the opinion that security cannot be guaranteed in Libya at this time. In addition, the embassy has been receiving reports that diplomats should expect further protests. 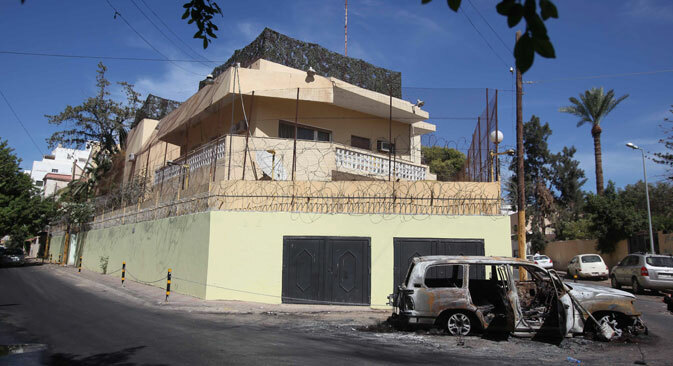 According to the Libyan Ministry of Foreign Affairs, the embassy was attacked because Russian citizen Ekaterina Ustyuzhaninova was charged with the murder of Libyan air force colonel Mohammed al Andalus al-Souci. "The [embassy] attack took place immediately after the funeral and was a reaction to the murder," a statement said. Ekaterina Ustyuzhaninova, who is charged with killing Libyan air force officer Mohammed al-Susi and seriously wounding his mother on Oct. 1, first arrived in Libya via Tunisia in September 2011, according to Izvestia. This was after Gaddafi was captured by the opposition in Tripoli. According to her friends, she passionately supported Muammar Gaddafi. In Russia, she had participated in protests against the war in Libya. At that time, in February 2012, she ran out of money and borrowed $2,000 to stay in a hotel. Russian diplomats from the embassy in Tripoli, according to her friends, took responsibility for her, paid her debt and put Ekaterina on a plane to Russia. However, the young woman—a power-lifting champion and a world-class bench-press athlete—did not stop there. After some time, she was back in Libya "to support the colonel." "I need Muammar Gaddafi to be alive. If this is not possible, at least Jamahiriya should survive, which he spilled his blood for," Ekaterina wrote in the last letter her friend in Russia received at the end of September. Ustyuzhaninova currently is in prison, being detained by Libyan authorities. Her friends are organizing a group to support the prisoner and want to demand that the Russian authorities do whatever they can to defend her. Since the regime change in Libya, the diplomatic missions of various countries have been attacked several times. On Sept. 11, 2012 al-Qaeda extremists organized an attack on the U.S. consulate in Benghazi, Libya. The U.S. Ambassador Christopher Stevens and three other American citizens were killed. The head of the Committee on Foreign Affairs of the State Duma and the head of the Russian delegation to PACE (Parliamentary Assembly of the Council of Europe), Alexei Pushkov, told reporters that the attack on the embassy in Libya is the logical consequence of the ill-considered regime change brought about by the West. Pushkov noted that, because of the desire of the West to change the regime in the country, "We have no democracy in Libya; there is just chaos and the rise of extremist radical organizations." "The policy of regime change and support of any opposition that is against a leader that is out of favor with the West results in this—chaos, loss of control and threats to diplomats," says Pushkov. "Whatever may be said of Gaddafi, he did not let extremists act in Libya," Pushkov says. Based on materials from RIA Novosti, Izvestia and Vzglyad.